What I love about Kenzo’s method for warping and threading is that you can either thread at a table or directly on the loom. He has so brilliantly economized motion! Before I learned this faster method of setting up my loom, warping seemed to take hours, but now I find that this system is so efficient and enjoyable, I’ll create several warps at a time to use later. 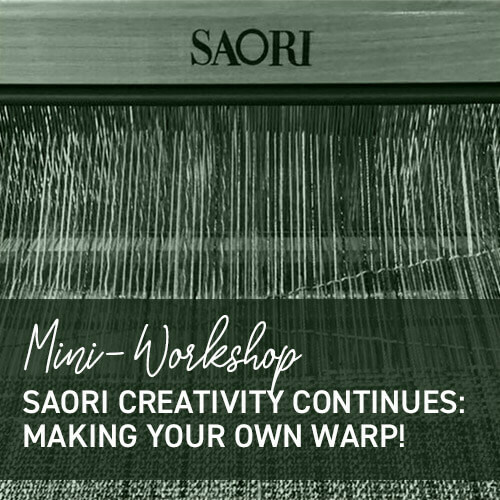 In this 4-hour mini-workshop, participants will be able to make one short warp (3 meters in length) and leave with it threaded on a Saori inside set. If time allows, students are encouraged to make another warp to take home, and save the threading for another time. This class is designed for current Saori weavers who either own or have ready access to a Saori loom. Thursday Open Studio Time students may reserve or purchase an inside set in advance and leave it at the studio fully warped and ready to work on. Cost: $65, includes use of all supplies and weaving materials for the first 3-meter warp. Additional warp materials will be subject to the usual supplies cost of $4/oz. Since seating is limited, reservations are required in advance.